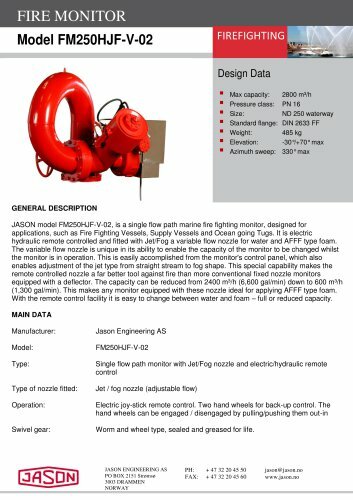 Design Data ■ Max capacity: ■ Pressure class: ■ Size: ■ Standard flange: ■ Weight: ■ Elevation: ■ Azimuth sweep: GENERAL DESCRIPTION JASON model FM250HJF-V-02, is a single flow path marine fire fighting monitor, designed for applications, such as Fire Fighting Vessels, Supply Vessels and Ocean going Tugs. It is electric hydraulic remote controlled and fitted with Jet/Fog a variable flow nozzle for water and AFFF type foam. The variable flow nozzle is unique in its ability to enable the capacity of the monitor to be changed whilst the monitor is in operation. This is easily accomplished from the monitor's control panel, which also enables adjustment of the jet type from straight stream to fog shape. This special capability makes the remote co ntrolled nozzle a far better tool against fire than more conventional fixed nozzle monitors equipped with a deflector. The capacity can be reduced from 2400 m3/h (6,600 gal/min) down to 600 m3/h (1,300 ga l/min). This makes any monitor equipped with these nozzle ideal for applying AFFF type foam. With the remote control facility it is easy to change between water and foam - full or reduced capacity. MAIN DATA Manufacturer: Model: Type: Type of nozzle fitted: Operation : Swivel gear: Jason Engineering AS FM250HJF-V-02 Single flow path monitor with Jet/Fog nozzle and electric/hydraulic remote control Jet / fog nozzle (adjustable flow) Electric joy-stick remote control. Two hand wheels for back-up control. The hand wheels can be engaged / disengaged by pulling/pushing them out-in Worm and wheel type, sealed and greased for life.